On Monday morning I pulled out my old juicer with the intention of dedicating two days to a fresh juice fast. I wanted to do something different to start my week, determined to only consume fresh vegetable and fruit juices, and I’ve heard health experts and nutritionists say it’s good to do periodically, so I was game. I thought things were going pretty well until 5:00 pm on Tuesday. 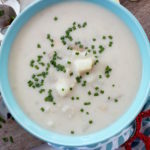 . .
That’s when my husband was cooking dinner and I found myself hovering, watching everything he was doing, asking how he was going to incorporate each ingredient, and salivating as he took every bite. Yes, I was literally salivating, craving the sensation of chewing! He finally looked at me and asked, “When are you going to eat something?” to which I sadly replied “Tomorrow” and he rolled his eyes. Don’t get me wrong, I actually enjoyed those carrot, apple, celery, cucumber, lemon and kale juices – they were delicious and quite filling. But the exercise confirmed that I really love to chew my food 🙂 So, on day three, I decided to make something really satisfying; something that required a GOOD amount of chewing. I love chickpeas (a.k.a. garbanzo beans) and always have at least one can in my pantry (plus a bag or two of dried). These little legumes are awesome because they’re packed with plant-based protein, fiber, and vitamins and minerals. 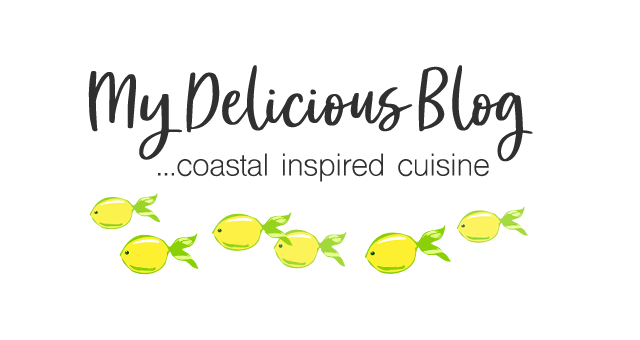 I love to add them to salads and soups and, of course I adore hummus. But baking them ’til crunchy is a whole new level of deliciousness. Then, onto roasting. You can cook them plain if you’re trying to avoid oil, or you can mix them with oil and salt (like I did). 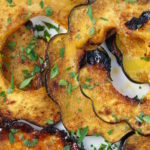 Once cooked, you can even add seasonings like curry powder, smoked paprika, oregano, chili powder, garlic powder or onion powder. 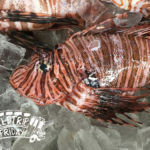 And if your spice pantry is bare, use pre-packaged seasonings like dried ranch dressing, or maybe one of the yummy spice blends available at The Spice and Tea Exchange (Vandouvan Curry and Coconut Thai were two of my recent favorites). 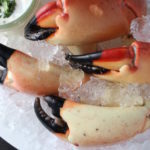 These little guys are best eaten within a day or two (uncovered) since they start to get soft if they sit too long. But trust me, they won’t last long, especially if you’re like me and NEED to chew something. **Cook’s Note: I’ve tried many batches and one of the key elements to achieving maximum crispiness is removing skins on the chickpeas. After rubbing them with a towel, check to ensure there are no skins on each chickpea. Yes, it’s a little labor intensive, but think of it as a nice relaxation exercise. . .you’re only focusing on each chickpea, not politics, what time to pick the kids up at school, or whether you remembered to mail your sister’s birthday card. Sounds good, huh? But really, if you’re in a hurry, just get most of the skins off, and you’ll still be ok.
P.S. 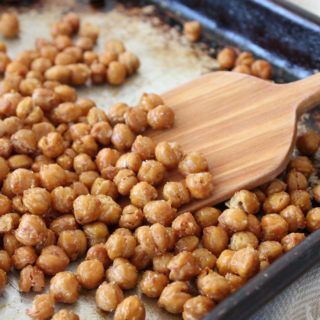 if you’re looking for another version of chickpeas, check out this recipe for Roasted Sweet & Spicy Chickpeas. 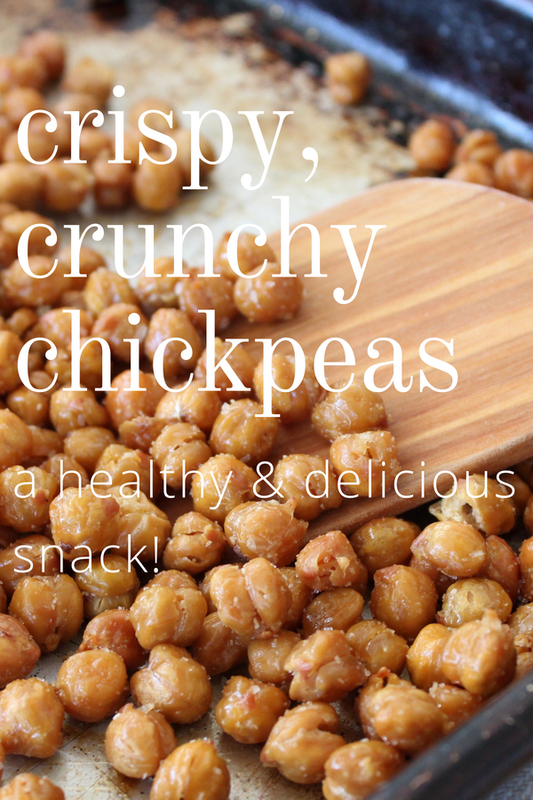 Roasted chickpeas with flavorful spices make an awesome, healthy snack. 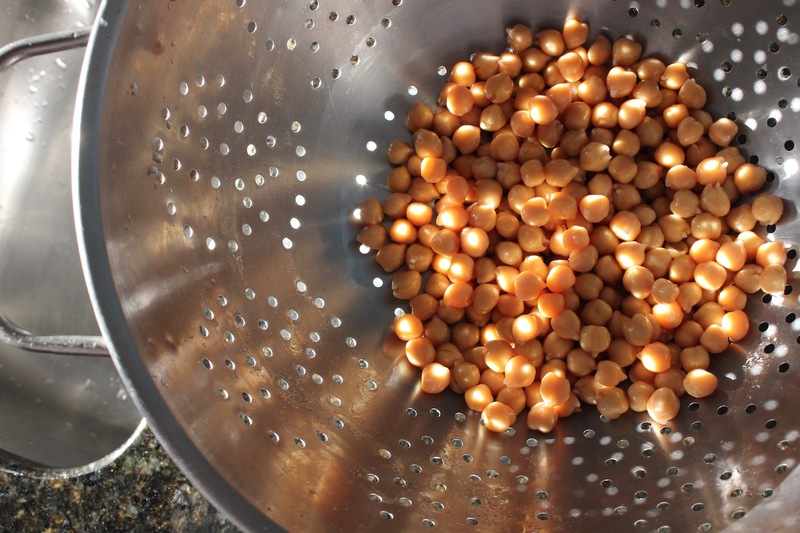 In a colander, drain liquid from chickpeas and rinse well. 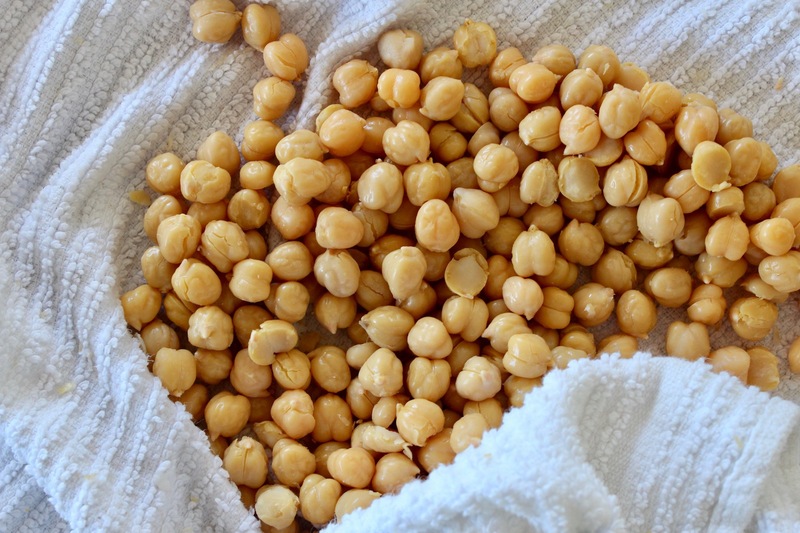 Transfer chickpeas to a clean kitchen towel and gently rub the towel over the chickpeas to start loosening the skins. If, after rubbing with the towel, some skins remain on the chickpeas, remove them by pulling the skin off each one with your thumb and index finger. Discard skins and transfer chickpeas to a mixing bowl. 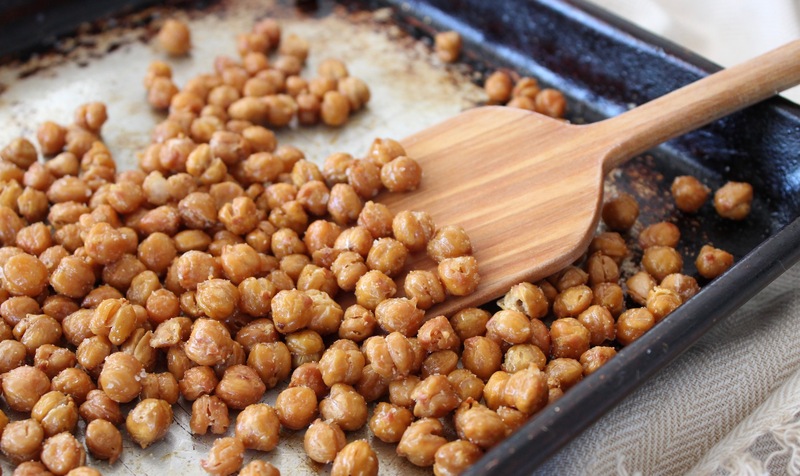 Add olive oil and salt and toss to combine then transfer chickpeas to a rimmed baking sheet. Bake 45-50 minutes, until nicely brown (you'll start smelling their nutty aroma around 40 minutes, so check to ensure they don't burn). Once you remove from the oven, sprinkle on desired seasoning while still warm and allow them to cool before serving (they'll get crispier as they cool). Loved your chick peas! Made some yesterday and they were delicious. Very satisfying. These look soooooooo good! Off to Detwiler’s I go. Hope you like them, Joe! Thanks. I want to do more with chickpeas. 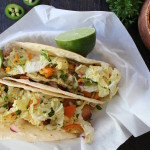 This looks yummy and will give it a try! 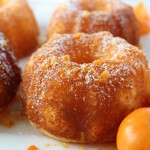 Easy to make AND tasty — enjoy! How long will they keep? Do they need refrigerator in airtight container? Hope they turned out yummy, Joyce! Yup – the skin removal is tedious, but it does help to reduce moisture retention. . .